It isn’t very enjoyable. You’re covered by a heavy apron, with a gadget held between your teeth. You’re told to sit still while a dentist’s assistant takes x-rays. Is it really necessary? Yes. Are digital x-rays an improvement? Absolutely! Your dentist can’t see everything that is going on with your teeth, bone, and surrounding tissue without x-rays. 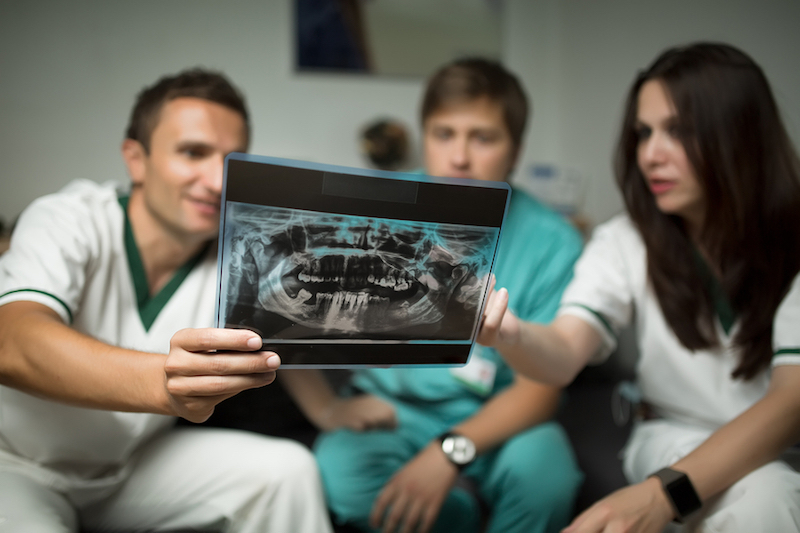 X-rays are one of the most important tools at any dentist’s disposal. They present a picture of your teeth and bones, and the soft tissues around them. What Hidden Problems Do Dental X-rays Detect? This depends on the patient. A patient with no history of cavities, no current tooth decay, no braces, and no existing crowns, veneers, or bridgework is at low risk for cavities. At the other end of the spectrum are patients with one or more of the following: a history of tooth decay, existing restorations, braces, worn enamel, or teeth that are chipped or cracked. Patients with an eating disorder or other medical condition may also be considered high risk. People who haven’t had their wisdom teeth removed also need to be checked with x-rays more frequently. At Steven T. Cutbirth DDS in Waco, we use the latest in dental technology, including digital x-rays. Digital x-rays are an improvement over traditional film-based x-rays. They’re faster, and provide better imaging. Best of all, the radiation exposure from digital x-rays is reduced by up to ninety-five percent. If you are a patient of Steven T. Cutbirth DDS, you’ll be counseled on the frequency of digital x-rays when your treatment plan is discussed. If you are not a current patient, we invite you to contact us for a consultation. Services include cosmetic dentistry and teeth whitening. Dr. Cutbirth is a holistic dentist; treatments are all in the long-term interest of the patient.